I would wait until no one was in my grandparent’s kitchen. I would sneak over to the fridge and pray that the large tub of Country Crock was within my stubby-four-year-old-arm’s reach. If it was, I would sneakily remove it from its place in the fridge and bring it over to the kitchen table. Silently, I would remove the top off of the tub of butter. Eureka! I would dip my fat little fingers inside of the container and eat the butter off my hands. Carefully, I would put the top back on the container and make sure to place it back where I found it in the refrigerator. My four-year old self did not understand that I had left substantial evidence of my shenanigans behind. There were little finger divots and prints left in the butter tub. I was the only four-year-old that frequented that house. I was caught red-handed. Several times. I will also NEVER live this down. I like butter. I like it in almost all forms. I am the weird kid that will hustle you for your buttered popcorn Jelly Bellies. True story. Naturally, when I heard of something called “Coconut Butter”, I was all ears. Is it just me or can the coconut really do anything? It’s a crazy miracle food. We can use it as a milk substitute, or use the oil to make granola, add toasted flakes to our salad or shreds to our donuts. And now, butter. Glorious, wonderful butter. You can spread it on baked goods. You can swap it out for other fats in baked goods. Drizzle it over your fruit for a sweet and savory snack. Add it to some freshly mashed sweet potatoes. Mix it with some nut butter for a super magical spread! Measure out your coconut flakes and put them into your food processor or into a high-powered blender such as a Vitamix. Add a dash of sea salt, if desired, and start blending. Process until your coconut starts to climb the sides of the machine. Stop and scrape the sides and continue to process. Repeat this process over and over until your mixture becomes smooth and almost liquid, much like peanut butter. This process can take upwards of 15 minutes depending on your machine. Just be patient and it will come together. If you are having a hard time having it all come together, even after a lot of blending, you can add a couple of teaspoons of coconut oil in order to help it come together easier. Your mixture is done when it is completely mixed together and the consistency of natural peanut butter. Store it in an airtight container. 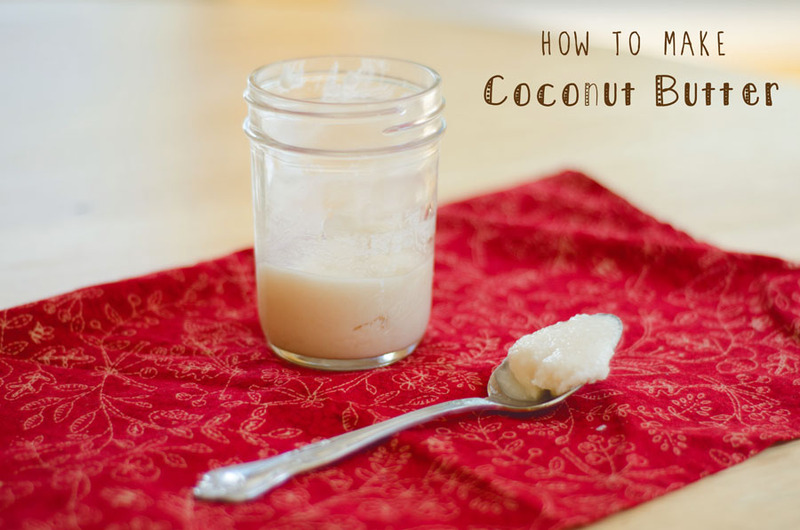 When your coconut butter cools off, it will become hard. You can heat it back up either by putting your container into a saucepan over a low heat, or by sticking it into a microwave for 30 seconds at a time. Make sure your container can withstand heat before heating it up with either of these methods. You will love it! So EASY. Dip dark chocolate in there. I dare you. I totally needed this recipe – THANK YOU!!! My children would ocassionally get busted sneaking swipes out of the Country Crock tub. Now I use the container for my dishwashing machine detergent that I make. They used to gaze longingly at it, wishing it contained that salty, sweet, yellowish viscous plastic pretend butter, knowing they would never have that again. It took time, but they are all on the butter train now. Yay. Real deal butter is so much better for you, and in my opinion tastes a lot better! If there had been sticks of grass fed butter in my Grandparent’s fridge… I can only imagine what would have happened. I know what I like. BUTTER! I totally need to give this a try!